While I was preparing my dinner and my ham and egg sandwich for tomorrow, I saw this news from TV Patrol World with Cory Aquino apologizing to former President Joseph "Erap" Estrada. I was really having this disapproval face when she blurted out this on stage. 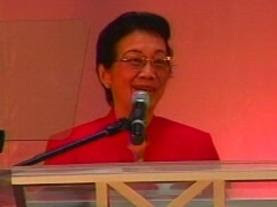 Corazon Aquino is apologizing for supporting the ouster of former President Joseph Estrada during Edsa II on January 2001. The former lady President looked thin and frail but somehow lost her sense of dignity when she apologized to Erap Estrada during the book launch of former Speaker Jose de Venecia, Jr. today at the Podium, Ortigas. What is the apology for anyway? It just make my face look sour every time I saw these political figures suddenly becoming friends. It will really make me mad when in the next month she will say sorry to the family of Ferdinand Marcos. Former President Joseph Estrada was guilty of PLUNDER. Let's just make that clear. RE: It will really make me mad when in the next month she will say sorry to the family of Ferdinand Marcos. Reply: Well looks like the Marcoses and the Aquinos are starting to reconcile and move on. You know Edsa dos was a big mistake, it was manipulated by shadow forces whom cannot accept the fact an action star becomes the president. I have thought of this during that so called edsa dos; that is why i say it was a big mistake, installing a dwarf. Yeah Erap was corrupt but the incumbent leader is worst and if you are an observant analyst, you can already predict that with the kind of supporters "she" have. Yan ang hirap sa pinoy, masyadong impulsive at sumusunod sa uso, kakaunting kasiyahan sa statue ni mama mary, and they go acting like morons with poor vindications. Guilty of plunder? If your in power you can do whatever you can to make your political opponents guilty. I just can't forget the attendance we imposed for students to join that rally in 2001, you call that a legitimate revolution then?